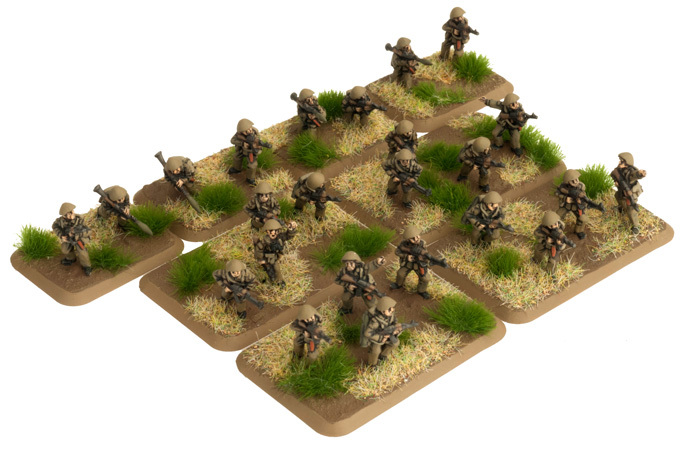 You know, you want to have your troops well-armed to take on numerous potential adversaries. The East German Mot-Schützen platoons certainly are. From several different types of anti-tank weapons to numerous anti-infantry weapons, including grenade launchers, they can take on just about anything the West can throw at them. The company's riflemen are armed with the classic AKM assault rifle, or MPi KM (Maschinenpistole Kalashnikow Modernisiert) submachine-gun as the East Germans called them. Each squad is also equipped with an RPK squad automatic weapon, disposable RPG-18 anti-tank rockets, and the powerful RPG-7 anti-tank rocket launcher. The company is backed up by a platoon of six belt-fed PKM machine-guns, as well as AGS-17 30mm grenade launchers, all mounted in BMPs.